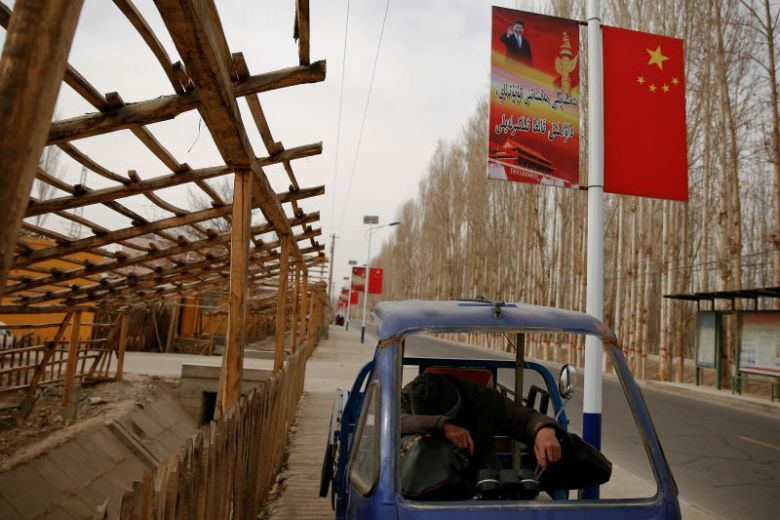 BEIJING - China's western Xinjiang region has amended its laws to legitimise the detention of Uighurs, in a move that experts say is a response to the harsh foreign criticism of Beijing's ongoing crackdown on the predominantly Muslim minority. The United Nations said in an August report that up to one million Uighurs are being detained in "re-education camps". This has led US Secretary of State Mike Pompeo and, more recently, US Vice-President Mike Pence to denounce China's treatment of Uighurs. "Survivors of the camps have described their experiences as a deliberate attempt by Beijing to strangle Uighur culture and stamp out the Muslim faith," Mr Pence said in a speech last week. Beijing blames Uighur separatist groups for violent attacks in the region and have said that these groups have terror links. The amended laws, which were passed on Tuesday (Oct 9), encourage local governments to combat extremism by establishing "vocational education centres" for the "educational transformation" of those influenced by extremism. These centres will also teach the Chinese language, laws and regulations, in addition to vocational skills training. The Uighurs are Turkic-speaking Muslims who make up about half of Xinjiang's 22 million-strong population. Mr Dolkun Isa, chairman of the Munich-based World Uyghur Congress, said the latest move was meant to "legalise" China's ongoing crackdown so as to deflect international pressure. "They just want to show the international community that everything they are doing is according to the law," said Mr Isa. But the amendments have drawn criticism. Ms Maya Wang, senior researcher at Human Rights Watch, said they served only to add "a veneer of legality" to what the Chinese government was doing in Xinjiang. Survivors of the camps have said they faced immense psychological pressure, and had to disavow their beliefs, eat pork and drink alcohol. other minorities, adding that it could represent the biggest imprisonment of an ethnic minority since World War II, and constitute crimes against humanity. In August, China told a UN committee that claims of mass imprisonment were untrue and that Xinjiang's citizens enjoyed equal freedoms and rights. Those sent to vocational educational and employment training centres were criminals convicted of minor offences, it said. On Thursday (Oct 11), Mr Hu Xijin, editor-in-chief of state-run tabloid Global Times, said in a Twitter post that the change was "in line with the spirit of law... and fits the reality of Xinjiang". "The tumultuous situation there has been brought under control, many lives being saved and peace/stability recovered. This is the greatest of all human rights," he added. China's Foreign Ministry spokesman Lu Kang told reporters at a regular press briefing on Thursday that the measures taken in Xinjiang to prevent and combat terrorism and extremism have "helped maintain social stability in Xinjiang, and safeguarded the livelihood of people of all ethnic groups". But experts say the amendments are a sign that Beijing could intensify its crackdown. Dr Adrian Zenz, a specialist on Xinjiang at the European School of Culture and Theology in Germany, said: "Overall, this clearly strengthens the legal basis for the type of re-education that has essentially been admitted by the state, indicating that it is determined to proceed with the current campaign."